Cynthia Port lives in the beautiful, rolling hills of Southern Indiana with her husband, two daughters, and a head brimming with stories. 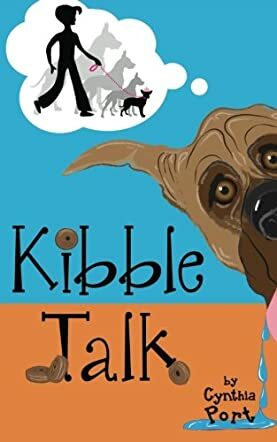 Her Kibble Talk series hooks readers of all ages with its wacky humor and imaginative plot, but just under the surface are heartfelt messages about acceptance and not taking others for granted. Writing for the young and the stubbornly young at heart, Cynthia's goal with each book is to create the best read aloud ever written. Young and old alike are going to have a howling good time reading Kibble Talk by Cynthia Port. Tawny is a fifth grader that never backs down from a dare ... so when her best friend Jenny dares her to eat a piece of dog food, well, she can't help but do it. Once she does, she finds that she can converse with dogs. When her dog Dinky, a giant Great Dane, reveals his one big dream of becoming a lap dog, she knows she has her work cut out for her. When the dog show comes to town, she decides to enter Dinky in order to help him achieve his dream. One thing's for certain; Tawny has her work cut out for her. Can Dinky the Great Dane become the inner small dog he has always dreamed of? I don't think I have ever read a book quite like Kibble Talk! It's a book that quickly appealed to me because of the cover, but after just a few pages I was hooked on the story and characters. Tawny is a funny character; she is just a bit shocked at the gift she has, and her dog Dinky has a way of getting her into trouble on occasion. The problems that crop up between her and Jenny seem very realistic, it even had me thinking back to my best friend in school and the squabbles that we had! I loved the resolution between the pair, and felt there were a few positive life lessons that readers would learn about friendship and how important it is. I also felt that the interactions with Tawny and her family were wonderful. The author captured a typical family who really had things going on beneath the surface, things that Tawney seemed to miss until Dinky pointed it out to her. Ms. Port is a wonderful storyteller who has the ability to provide a visual feast of funny situations where Dinky was concerned. I found myself laughing out loud at his need for pink; it was really like his inner diva was unleashed. I could just see this huge Great Dane with pink polished nails trying to fit into a kennel that he could only get his head into, and that's just how the entire story went. I was never sure what might happen next, but I knew it would keep me laughing! This book is a perfect read for anyone. With catchy chapter titles and a plot with never a dull moment, it truly is a book that I really couldn't put down. Animal lovers are in for a real treat, but honestly, anyone looking for a page turning, laugh out loud read will be delighted with Kibble Talk as well. Oh. My. Goodness! This sounds like a book I would love. Am adding it to my reading list.